Freeman is the director of the Foreign Influence Transparency Initiative at the Center for International Policy. 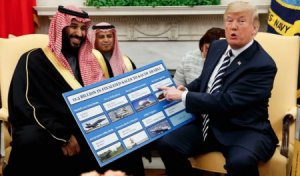 He just wrote the piece for TomDispatch: “The Saudi Lobby Juggernaut,” which states: “The growth of Saudi lobbying operations [has been] extraordinary. In 2016, according to FARA records, they reported spending just under $10 million on lobbying firms; in 2017, that number had nearly tripled to $27.3 million. And that’s just a baseline figure for a far larger operation to buy influence in Washington, since it doesn’t include considerable sums given to elite universities or think tanks like the Arab Gulf States Institute, the Middle East Institute, and the Center for Strategic and International Studies (to mention just a few of them).